Generally only available pasteurised in keg. Has appeared occasionally on cask. 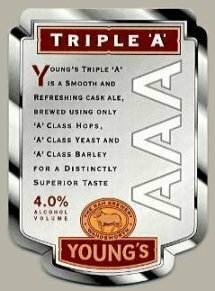 Available in keg Triple 'A' has a smooth, creamy head and clean taste with a hoppy and citrus character derived from English Pilgrim hops. I liked this beer actually. I can see how people say it tastes a little like hay, because it does, but in a good way for me. Not really as flavorfull as a real ale, but quite refreshing, especially on a hot day. I would drink it again. Bottle 14/09/2003 Amber golden coloured and hoppy. Some dryness in a full malt finish. An ale for non-ale drinkers? Thjis was launched to reach thos who are not too fond of the Young’s real ales, so it is a sort of compromize between a bitter and a lager. Served cold it is hard to get the nuances in flavour, but it certainly quenches the thirst on a hot day! Dark honey yellow with steady yellow whip cream head. Sweet and floral aroma with Liberty hop aroma. Fruity, grassy, trefoil flavor with late bitterness. Mouthfeel is smooth though palate is a bit thin. Good session beer. Draught at the Young’s Ram Inn, attached tot the brewery. A very strange mouldy aroma, perhaps sulphury. Woody, strawy taste. Not very good. cask cond at youngs brewery: i feel like im going against the grain here, but my pint was exilerating. beutiful golden tan color with nice creamy head when pulled from the cask. very well balanced malt hop character slight orange feel. no bail of hay here....ask if its cask! Lamb & Flag, Covent Garden, London. Oh good grief... it tasted like a bale of hay. So depressing to end my Europe trip on such a note. Oh well, drinking anything on the sidewalk of Rose St, outside Lamb & Flag while listening to a New Orleans jazz band on the second floor is great no matter what.